Framed print of a watercolor painting by Kathy Kleinsteiber. Photo courtesy Kathy Kleinsteiber. Copyright Kathy Kleinsteiber. Come see our newest art display at the Environmental Education Center in Alviso and learn about some of the native plants, birds and insects in nearby oak woodlands! Local artist Kathy Kleinsteiber has donated framed prints of her watercolor paintings to the San Francisco Bay Wildlife Society to be sold. The entire sale price will go toward the educational programs in Alviso. These high-quality, limited edition giclee prints are framed with archival mats, wood frames and plexiglass glazing. The artwork will be on display until November 30, 2017. You may purchase any print now, but will need to come back after the exhibit to retrieve your purchase so that the show will remain intact for others to enjoy. Hurry in for the best selection! Bring a picnic and enjoy the Bay Area's wetland wildlife at the Don Edwards San Francisco Bay National Wildlife Refuge. Take part in Shark Day at the Environmental Education Center in Alviso on Saturday, October 21, 2017 from 10:00 a.m. to 3:30 p.m.
For directions and more information: USFWS website or call 408-262-5513. Shark Day is sponsored by the City of San Jose (Living Wetlands Program), Santa Clara Valley Urban Runoff Prevention Program (Watershed Watchers), The U.S. Fish and Wildlife Service, Marine Science Institute, and the San Francisco Bay Wildlife Society. 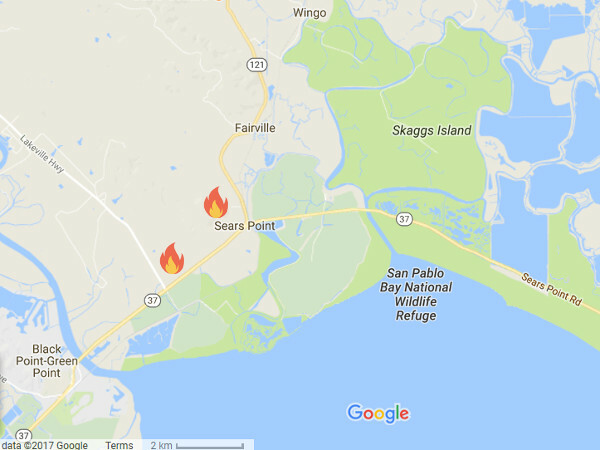 NorCal wildfires swept over parts of San Pablo Bay NWR from October 9 through 11, 2017. Credit Google Maps. Wildfires sweeping the wine country in northern California destroyed 222 acres of refuge land at the Sears Point Unit of the San Pablo Bay National Wildlife Refuge on October 11, 2017. A back burn conducted two days earlier by the Lakeville Volunteer Fire Department on the 5 acre compound of the refuge headquarters ensured that all the structures there survived intact. Come celebrate National Wildlife Refuge Week this year from October 8 through October 14 at the Don Edwards San Francisco Bay National Wildlife Refuge. On October 14, drop by the refuge to celebrate nature by exploring your creative side. Whether it’s browsing artwork by local artists, crafting animals out of paper, or creating an animal-shaped yummy treat, there’s something for everyone. Take part in some or all of the activities listed below. Animal Desserts: Get ideas for your next wildlife-themed party. Time to landscape your yard before the rains start with drought-tolerant, native plants from the San Francisco Bay Area. Create habitat for pollinators and birds around the San Francisco Bay. Plants sold by the San Francisco Bay Wildlife Society. Saturday, October 7, 2017 10:00 a.m. – 2:00 p.m.
For more information, call Carmen Minch at 510-792-0222 ext. 476. Dr. Chris Kitting, a founding Board Member of San Francisco Bay Wildlife Society, is submitting a poster titled Celebrating 30 years of Francisco Bay Wildlife Society: A pilot study on macro-invertebrate recolonization at the bottom of dredged Stockton ship channel in the California Delta, at the 13th Biennial State of the San Francisco Estuary Conference in October 2017. Every two years, the San Francisco Estuary Partnership brings a focus on the management and ecological health of the San Francisco Bay-Delta Estuary. The State of the Estuary Conference showcases the latest information about the estuary’s changing watersheds, impacts from major stressors, recovery programs for species and habitats, and emerging challenges. A Poster Session Reception will be held in the early evening on October 10th. The poster session allows participants to present findings and meet colleagues in an informal setting, including the presentation of detailed, technical information on individual topics and studies that cannot be covered adequately in the plenary sessions. The posters will be on display for the duration of the conference. 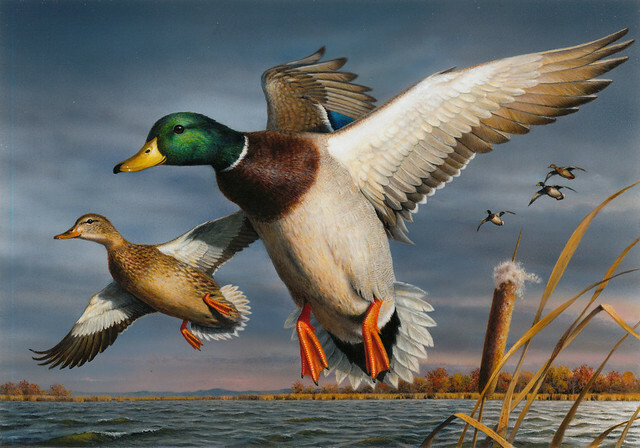 Bob Hautman's acrylic painting of a pair of mallards is the winner of the 2017 Federal Duck Stamp Art Contest. Credit USFWS. Bob Hautman, an artist from Delano, Minn., is the winner of the 2017 Federal Duck Stamp Art Contest. The announcement was made today by U.S. Fish and Wildlife Service Principal Deputy Director Greg Sheehan at the annual art contest, held at the University of Wisconsin-Stevens Point at the Noel Fine Arts Center. Come help Don Edwards San Francisco Bay National Wildlife Refuge prepare for the upcoming hunt season by volunteering to clean up the hunting site and repair hunt blinds in the Alviso Pond area. The refuge relies on volunteers to maintain the hunt blinds. What to Bring: Blinds are in ponds. Bring a flat bottom boat. Boats with a Go devil Motor or Beaver Tail motor highly recommended. Canoes and Kayaks also good. A 0.4-mile stretch of Marshlands Rd. from Thornton Ave. to the first parking lot is undergoing construction beginning September 1, 2017 and is expected to end February 1, 2018. The bridge that crosses over the slough is to be replaced with one that meets earthquake safety standards. To minimize disturbance to endangered species habitat, a short section of the road will be reduced to one lane with traffic controls. Expect delays when leaving and entering the refuge. The Harrier Spur Trail and the LaRiviere Marsh Trailhead that connects to Marshlands Rd. will be closed during this time. We are accepting new Board of Director members. Those with legal backgrounds and business financial experience are particularly needed.